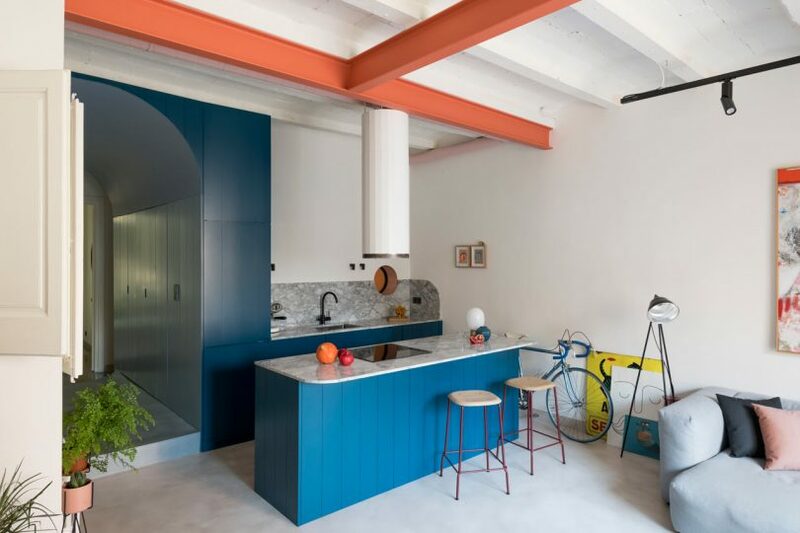 An apartment next to the Sagrada Familia in Barcelona is renovated with shades of blue and coral. Located on a green passageway next to the Sagrada Familia in Barcelona, the FONT 6 Apartment renovation was a project close to home as it belongs to one of the architects, Andrea Serboli. It was designed by CaSA and Margherita Serboli Arquitectura as an example of what the firms are capable of and they converted it to a wunderkammer, a restful retreat outfitted with the owner’s important objects and memories. The apartment is located in a 1914 modernist building that had been neglected. While some of the original details remained, many of them were in a state of disrepair but they saved what they could. Originally the 75-square-meter apartment was broken down into six small rooms before the layout was reconfigured for modern day living. An optical glass window in the kitchen filters light into the bathroom. The blue curved arc of the hallway connects the daytime part of the apartment with the night areas. The same blue is found on the kitchen cabinets which boldly complements the coral ceiling beams. A blue, wood paneled box was inserted into the middle of the floor plan to make better sense of the space. The box houses closets and storage with a bathroom hidden in the middle of it. Square grey tiles cover the lower portion of the bathroom with contrasting grout in a coral/terracotta shade.